Can Tho (VNA) – The APEC Ocean and Fisheries Working Group (OFWG) opened its ninth annual meeting in Can Tho city on August 21 to discuss a common action plan for the APEC economies and regional and global cooperation activities to sustainably develop fisheries and sea- and ocean-related fields. The meeting is part of the APEC Food Security Week and a high level policy dialogue on enhancing food security and sustainable agriculture in response to climate change in the Mekong Delta city. At the event, delegates from the 21 APEC economies focus their discussions on the region’s common action plan on ensuring sustainable use and development of fisheries resources in Asia-Pacific, the improvement of coastal communities’ resilience to natural disasters, and the enhancement of the economies’ connectivity to protect the marine environment and effectively exploit ocean resources. They are scheduled to update on the implementation of some initiatives in promoting the marine debris treatment capacity, build a set of tools to assess ecological risks caused by climate change impacts on fisheries, and look for ways to attract the private sector to marine environment protection and sustainable livelihood and fisheries promotion. 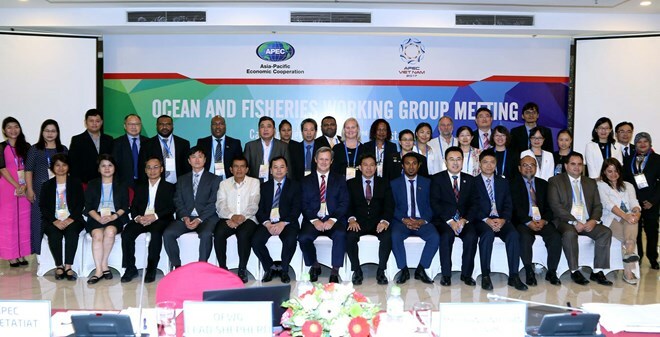 Tran Dinh Luan, Deputy General Director of the Directorate of Fisheries under Vietnam’s Ministry of Agriculture and Rural Development, said the APEC members account for more than 80 percent of the aquaculture output and over 65 percent of the exploitation output in the world. Their seafood consumption is also much higher than the global average. Therefore, it is critical to form a common action strategy to increase exploitation and aquaculture output and reduce post-harvest losses, he noted. He added the region’s fisheries are also facing numerous challenges as worsening and unpredictable climate change is making the region’s fisheries more vulnerable to natural disasters and diseases. As the host country, Vietnam will make efforts to help the meeting reach the expected outcomes, Luan said, adding that it will also make active contribution so that its initiatives can leave a hallmark in the region’s common action plan and relevant projects.